A frequently requested feature on a website is a rotating image or news section. I recently discovered that WordPress’s default theme, Twenty Eleven has this built in. It’s not the most obvious feature, but easy to implement. Here’s a working example on my Site. The trick is to use the the Showcase Template in the Twenty Eleven theme and make some of your Posts “Sticky”. Make sure you are using the Twenty Eleven theme. You can select this from Appearance > Themes. Create a Home Page if you haven’t already. 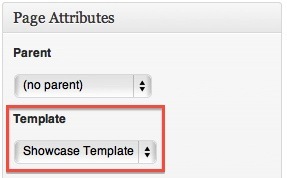 Edit your Home Page and select Showcase Template in the Templates drop-down menu in the Page Attributes box. 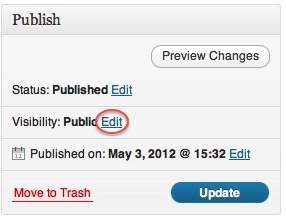 Click Publish or Update to save changes to your Home Page. With these changes, your Home Page will now show your page’s content and then your most recent Posts below. Check the “Stick this post to the front page” box. Your Post is now “Sticky”. It will now appear on your Home Page in a section called Featured Posts. Follow the steps above to make other Posts “Sticky” to appear in this section. You can also select several Posts at once and make them all Sticky. The Posts you selected should now be Sticky and be part of the Featured Posts rotation. If you want images to appear in the Features Posts or even Recent Posts section of your Home Page, you will need to set a “Featured Image”. In the Featured Image box on the right, select Set Featured Image. This will open up a Media Upload window. You can either drop or browse for an image here, or if you already have one in your Post, select Gallery. Select the image you want to use and click the “Use as featured image” link at the bottom of this window. Save All Changes and close the window. Your Featured Image box should now display your image. 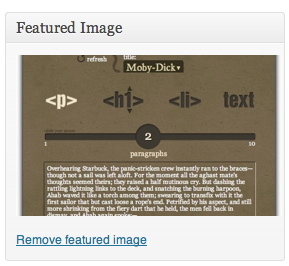 Your featured image will now be a part of the display on your home page. Note: If the featured image is larger than your header image area, the rotation will display a large version of the image. This is a nice way of rotating images. Very well written and explained with clear steps.. It can guide a naive user to accomplish the effect of rotating posts and images… best part though is having used a working/live example…. A very nice explanation given for showcase template. The step by step process with the images makes anybody to understand the process. Thumbs up.. Thanks for the guide, helped me out alot! will it work on default Twenty Twelve as well? No, I’m afraid Twenty Twelve doesn’t have the Showcase Template. It seems to be more limited than Twenty Eleven.